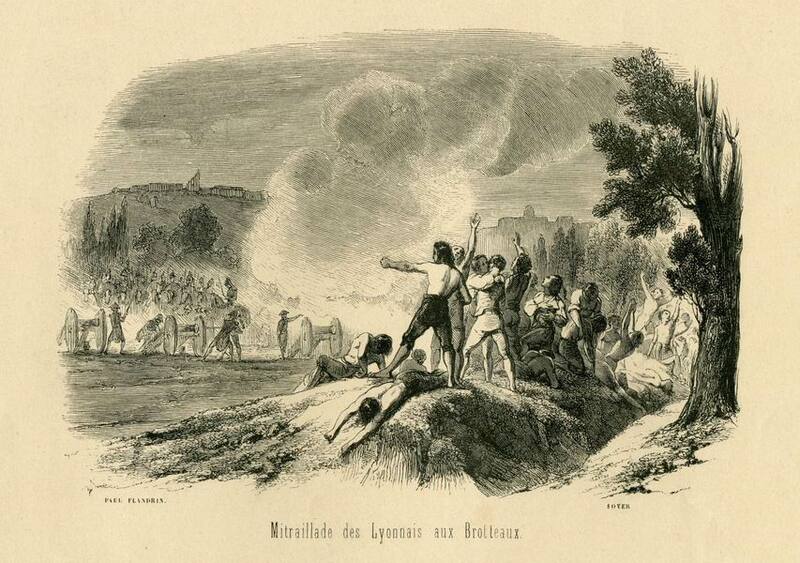 In July 1793 the surrender of the Lyon federalists to the Army of the Rhine heralded one of the worst atrocities of the Terror, the judicial murder of almost two thousand people in the sort space of five months. How, one wonders, did the bright hopes of 1789 come to this? In retrospect the whole episode has a surreal air. 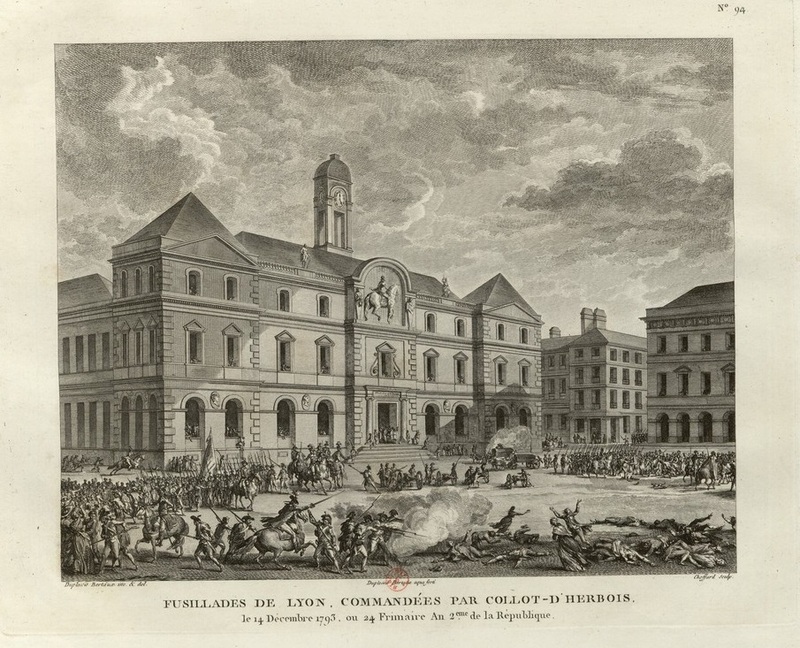 In its notorious decree of 12 October 1793, the Convention, under pressure from Collot d'Herbois and the Jacobin ideologues, committed itself to a policy of wholesale Revolutionary retribution against the "rebellious city". 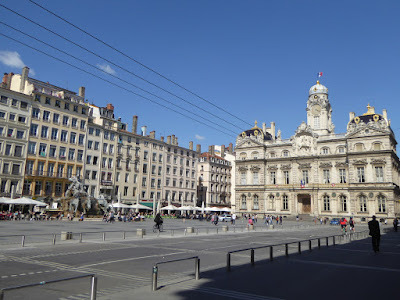 Lyon was to be utterly "effaced and demolished", down to its very name; henceforth it would be known as as "Ville Affranchie", "Liberated City". Over its ruin was to be raised a national monument inscribed, "Lyon made war on Liberty. Lyon is no more". Couthon, the représentant on the spot, was more realistic. There was much hyperbole and wielding of silver hammers, but he was reluctant to proceed to wholesale demolition. Four days after the decree, he wrote to Saint-Just, pleading ill health and asking to be relieved of his post. Couthon's withdrawal made way for a new ruling Commission of whom the senior members were Collot d'Herbois and Fouché, two implacable Terrorists newly elevated to the Committee of Public Safety. Collot arrived on 4th November, Fouché, perhaps advisedly, a few days later. On the 25th November the Revolutionary Army, consisting of several hundred men with cannon, under the leadership of Ronsin, marched into the city. The elements of Revolutionary extremism were now in place. The machinery of Revolutionary justice had not waited on the arrival of the new Commission. Among the very first acts of the victorious Jacobins was the installation of a military tribunal to try rebels taken in arms. Couthon and Maignet also created a Revolutionary Tribunal (Commission de justice populaire) which sat in the courtroom of the prison of Roanne to dispense revolutionary justice against the chief civilian conspirators, the têtes pensantes, of the revolt. The Tribunal was headed by the playwright Antoine Dorfeuille, a friend of Couthon, and Claude-Joseph Merle, public prosecutor in the criminal court of l'Ain. The guilty, guillotined in the place Bellecour, included the ringleaders of the insurrection, Bénami, the président Jean-Jacques Coindre and the juge de paix Jean-Jacques Ampère. For Collot and Fouché this was far from enough. (It was said that Collet, in a former life director of the Théâtre de Lyon, had little love for Lyon, where he had once been booed off the stage.) Whereas Couthon had punished active rebels, the new Commission denounced the complicity of the city as a whole. The agenda took on the rhetoric of class war. According to Collot there no reliable patriots at all Lyon apart perhaps from 60,000 working people who might be distributed to other parts of the country and shaped into true republicans. On 10th November Collot d’Herbois, Laporte et Fouché set up a Temporary Commission of Surveillance with sweeping powers of search and denunication. On 27th November a Commission Révolutionnaire was organised, to act as a final tribunal, under the presidentship of another implacable Revolutionary, le général de brigade Pierre-Mathieu Parein. These two bodies superseded all previous courts. The Revolutionary Commission was originally composed of seven members though only five actually sat. They assembled in the salle du consulat of the Hôtel de Ville, on the Place desTerreaux, from nine in the morning to midday and from seven to nine in the evening. A long table, illuminated by eight torches, cut the room into two. On one side sat the judges in their military uniforms, armed with a sabre, and with a little axe on a tricolour ribbon suspended at their throats. The clerk sat at one end and the secretary at a separate little table facing the judges. Behind a barrier around the room, were the public who attended the sittings. The prisoners were called in groups of two or three and, flanked by two gendarmes, were seated on a bench. The procedure consisted of a series of questions to which each had to answer individually. In all cases the judges referred to the register of the committee of survellance. Judgment was rapid and without appeal - six or seven prisoners could be despatched in a quarter of an hour. If the judges touched the axe round their neck the prisoner was condemned to the guillotine; if they touched their foreheads, he was to be shot. If they stretched out their arms on the table, the prisoner was set free. Once the judgment was given the prisoners, preceded by the turnkey, decended into the cellars by a spiral staircase and divided into two holding caves. One led to liberty and the other straight to the guillotine, which was now erected on the square outside. Together we went up the rather dull grand Staircase of the Town Hall and made our way through splendid rooms with gold tracery on the walls and tall windows, to what is called the Salle de la Conservation. “Before the trials”, said Paul Feuga, “the prisoners were kept in convents and monasteries all over Lyons. Once every three days, long processions, linked together by a chain like galley slaves, were marched through the streets to the Town Hall. Here they were kept in a large room like this one.” Paul Feuga looked round at the elegant emptiness. With no furniture it was easy to see it crowded with ragged men and women, chattering, weeping, trying to keep their spirits up. “Every day, they were given a pound and a half of rye bread and, on arrival, issued with a blanket and a bale of straw. Their situation was similar to that in the old palace of the Luxembourg in Paris, with everyone herded together in what used to be splendid state rooms, with the walls disfigured with the graffiti of names and farewell messages. I could see it all suddenly as if they were there, as in a surrealist dream. “The prisoners were questioned for only five to ten minutes, as there were so many of them. Much depended on their answers to a few direct questions: Did you fight in the seige? What do you think of Louis Capet? Do you believe in God? “The judges made signs to show their verdicts: if it as the guillotine, they touched a little axe which hung from the tricolour ribbon round their necks. If the firing squad, they touched their foreheads. If the prisoner seemed innocent, they stretched an arm along the table. “The turnkey was supposed to decipher the final decision of the President of the court. Taking the prisoner by the arm, he led him, or her, over there.” We walked out of the room, turned left and descended an ancient , stone, spiral staircase whose steps, Paul Feuga told us, were held together by pressure rather than mortar. At the bottom we entered a spacious reception hall, just behind the main door, which gave onto the Place des Terreaux. Then down into the cellars. “The turnkey took the condemned prisoners over to the left, into what was called the “mauvaise cave”. We looked round under naked light bulbs at the long, empty cellar with barred windows round the walls. “The innocent were led to the “bonne cave”, on the right.” Paul tried a door but it was locked. 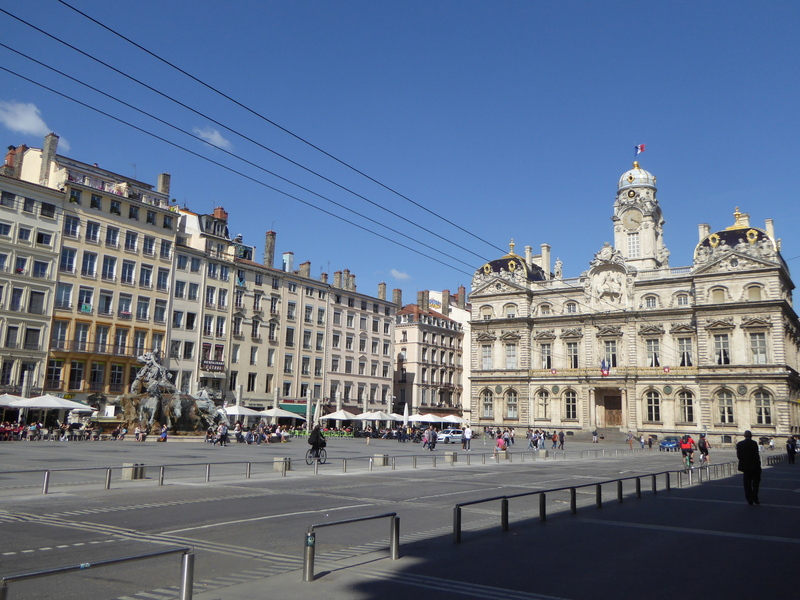 We walked out, round to the Place des Terreaux, and stood on the steps leading from the Town Hall entrance. Ahead of us lay a simple square with a nineteenth-century bronze statue in the middle, depicting a woman with children being borne along by straining horses. On the left was the mass of the Palais des Arts, which before the Revolution had been a convent, and on the right a series of colourful eighteenth-century terrace houses. "Those who were to be released were marched out to stand on these steps, and were welcomed back to the bosom of the Republic with ceremonial speeches. "The condemned stood in front of the same steps. When the executions first started, they were shot. However, the bullets also penetrated those barred windows you can see in the Town Hall basement. Sometimes the prisoners inside were wounded. Once, a guard had his arm shattered, so the fusillades were moved elsewhere. "Two weeks after the end of the siege, the guillotine was erected here, just in front of the steps. There was a tradition that criminals should be punished on the site of their crime, and it was here that Chalier had been guillotined. The problem, though, was that the executioners, Ripet and Bernard, were in prison, accused of Chalier's murder. Ripet's brother took over. "From the end of October 1793 until the beginning of April 1794 850 people were guillotined." Paul took a piece of paper from his pocket. "Here's a copy of an article in the local paper of the time, which might interest you. It's the imagined correpondence between the guillotine of Lyons and the one in Paris.' He started reading: '"Since the 12th October until the 22nd December, I have already sent 777 heads to the Devil, except for a few who have escaped because of the fusillades. To how many curés, vicars, host carriers, sacristans, beadles and dealers in 'Holy Bread', have I given a good 'Peccavi' with the edge of my revolutionary iron." "It's extraordinary how many priests seem to have been executed." "Yes, those who refused to take the oath were regarded as the most dangerous counter-revolutinaries of all because they could influence their flocks. However, the residents complained of the miasma of blood, spilt on beaten earth. So the guillotine was moved to the other end, in front of what is now that department store, the Galerie des Terraux. From there, a ditch was dug along what is now the Rue Constantine, there, so that the blood flowed into the Saône. "The executions were watched by two representatives from the first floor of the second house, which you can see on the right. It was then a café called Antonio...Now it is a chess club, there, above that café called "La Fleurie". Shall we go in and have a drink?" John Haycraft, In search of the French Revolution, Secker & Warburg, 1989, p.198-201. For the first month or so executions continued at the rate of about a dozen a day, but this was not considered sufficient; Revolutionary justice is prompt, proclaimed Collot d'Herbois. There now followed the notorious mitraillades, an essay in mass execution which took place in the plain of Des Brotteaux a marshy expanse across the Rhône from the main city which had already been used for some time for firing squads. It was a convenient place to dig ditches to receive the bodies. On 4th December 1793, day of Loi de Frimaire, sixty prisoners, described as "sixty young men" were brought before the Revolutionary Commission from the prison of Roanne, then led out to their deaths. John Haycraft imagines their long final march across the Pont Morand and along the far bank of the river opposite the ruined facade of the Hôtel-Dieu (p201). When they reached the execution site they were bound together in pairs on a raised area of about three feet bordered by two parallel ditches. A line of soldiers and dragoons were positioned on either side. Behind them were two (n some versions three) cannons. 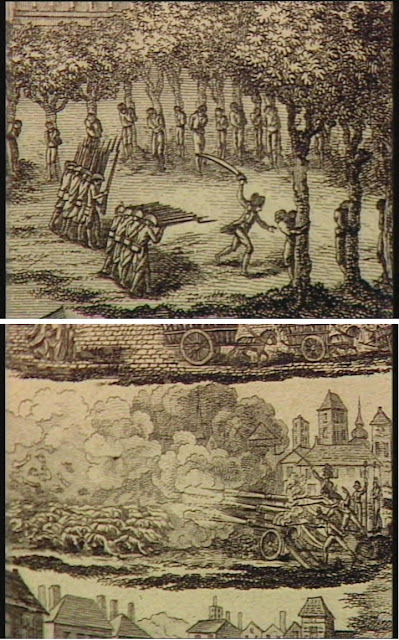 Although it is commonly said that the prisoners were raked with grapeshot (la mitraille", hence the "mitraillades"), the most reliable accounts say that the initial round used normal balls. As the cannons discharged , the condemned men sang the Hymn of the Girondins Mourir pour sa patrie / Est le sort le plus doux ("To die for one's Country / Is the sweetest of Fates..."). Only a third were killed outright. 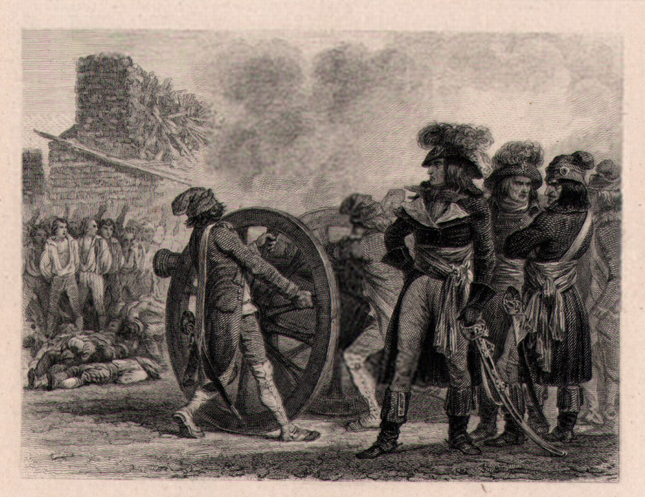 Some members of the execution squad resorted to their guns and a second round, this time of grapeshot, was discharged from the cannons, Despite the drum rolls the cries of the wounded were audible. The soldiers then were ordered to finish off the remaining wounded with their sabres. To the disgust of everyone concerned, due to the inexperience of the swordsmen, who were mostly volunteers, the grim business took over two hours to complete. Undeterred, on the following day, 5th December, the Commission sent the 209 remaining prisoners from the prison of Roanne to be executed. The Commission restricted itself to asking the accused their name and profession and did not even trouble to count them - two innocent visitors were said to have been herded off with the others, though a certain cavalry captain called Barbier escaped. The prisoners were taken down to place des Terreaux to have their sentence read out. As they were denounced as rebels against the "national will" and "conspirers against liberty", their outcry drowned out the words and they had to be rapidly hassled away. Only at the pont de Morand was it discovered there was an extra man present; Collot, when given the news replied that it mattered little whether the rebels died today or tomorrow. The prisoners were taken to a more remote spot - the site of the present Crypte des Brotteaux - and their bound hands tied to a cord suspended between two willow trees. This time the canons were abandoned in favour of execution by firing squad at very close range. Again not all were killed. Some attempted to run off, only to be pursued and cut down by the dragoons. A few were said to have still been alive the next day and had to be finished off by the spades of the gravediggers. Notwithstanding, this second act of carnage, a number of further mass executions took place in the course of December, the largest of which involved sixty-eight prisoners; the condemned continued to be guillotined and shot individually after this time. It is not known precisely who instigated the policy of mass executions. Collot d'Herbois was singled out, since it was he who was subsequently tried and condemned; in the letter to Duplay quoted above he affirmed his general approval, though elsewhere he criticised the inefficiency of the proceedings. The order, however, constituted the official will of the representatives as a whole. from a drawing by Jean-Paul Flandrin, 1845. Although a few of the executed were buried in the cemeteries, the majority were buried in communal graves. Following the mass executions, the bodies were immediately consigned to deep ditches, with a layer of quicklime up to a metre thick. Subsequent excavations have revealed the ditches in situ at various different locations in Les Brotteaux. Every so often unexpected reminders of 1793 still resurface in Lyon: In 1991 three decapitated skeletons, presumed to be victims of the guillotine, were discovered by construction workers building an underground parking lot in front of the Hôtel de Ville. In 1911 the Lyon historian Antonin Portallier produced a detailed biographical listing of those executed; he counted 1905 condemned to death between the 12th October 1793 and the 16th April 1794, of which 1876 were actually executed: 721 were guillotined and 1155 were shot, either individually or in the mitraillades. Three quarters of the deaths took place under the Revolutionary Commission after mid-December. In 1925 a official report and list was produced for the Commission in charge of the commemorative Monument des Brotteaux. This was reproduced in facsimile in 1989 but this is not now generally available. It presumably provided the basis for the lists displayed in the memorial chapel, which include ages and professions as well as names. During the Terror from 12th October to 6th April 1794, there perished two thousand people of all ranks and ages, arrested without motive, condemned without defence and struck down without mercy. 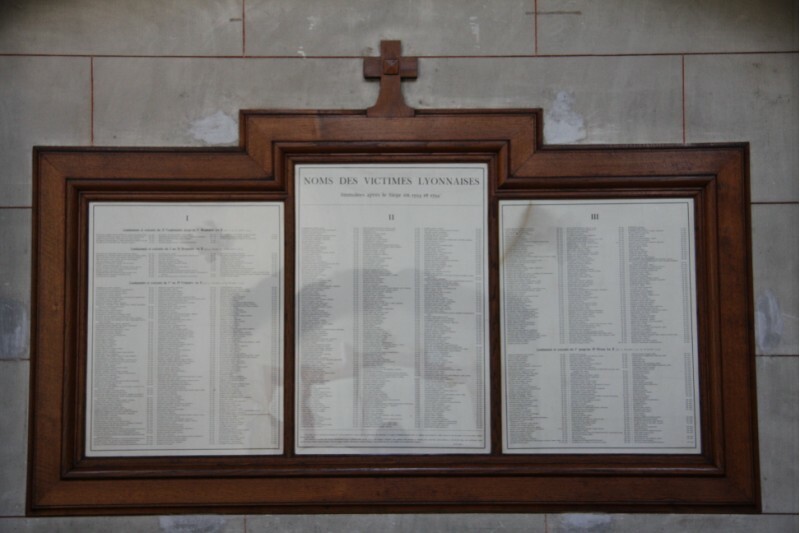 The lists of the dead do not include the names of the defenders who perished on the 29th May, or during the siege and final assault; nor those of the Lyonnais who died in the prisons where thousands of citizens, women, and priest were detained as suspects. They are buried in the cemeteries of Loyasse, la Quarantaine, Saint-Georges, Saint-Irénée, Saint-Paul, les Chazaux, la Croix-Rousse, etc. Many proscribed priests risked death, taking refuge among the faithful, administer the sacraments and celebrating mass in woods, isolated farms and poor dwellings in the city; in Lyon they went into the prisons and waited by the guillotine on the place des Terreaux or at the entry of the pont Morand, in order to give final absolution to the condemned. Maurice De BOISSIEU Le monument religieux des Brotteaux. Historique de la commission. Liste des victimes du siège de Lyon 1925. In 2014 the Japanese historian Takashi Koï published a new statistical study. He himself provides a summary on the blog "La Révolution et nous": his numbers vary only marginally from those of Portallier. Takashi Koï's findings lend support to the idea that executions under Couthon were mainly confined to the leaders of the insurrection. Total numbers condemned to death were 215, 102 for the Commission militaire and 113 for the Commission de justice populaire. Of these 86% of those condemned by the military tribunal were officers in the Lyonnais army and 77% of those condemned by the Commission de justice populaire officeholders in the rebel administration. Executions ran at about three per day and acquittals were more numerous than death sentences. Most common soldiers and all those under the age of nineteen were acquitted. There was a definite social bias against the rich but, according to Takashi Koï, this reflected the pattern of denunciations in the local sections rather than a policy imposed by the representatives of the Convention. Under the Commission Révolutionnaire here was a dramatic increased rate of executions, though the new tribunal still acquitted almost as many as it condemned (1 669 acquitted as opposed to 1683 found guilty). The total number accused represented up to 10% of heads of household in most districts of the city. What was the socio-economic breakdown? Those categorised by Takashi Koï as "the rich" were a fifth of the city's population but funished 43% of those condemned to death by the Commission Révolutionnaire. Officials and members of the liberal professions were heavily represented and, among those drawn from outside Lyon, priests and former nobility. 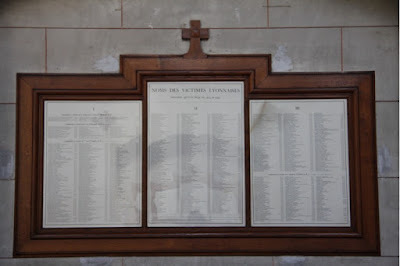 (103 names on the Brotteaux tablets are priests or members of religious orders). In contrast the "popular" category - silk workers, labourers and servants - were third of the total population but only 10% of the condemned. It is obviously difficult to unravel the bias of the tribunal from the underlying complexion of the rebellion; historians like Bill Edmonds, have emphasised that the insurrection in Lyon originated in the sections and was republican and popular in nature. "Examination of the list by age: 19, 22, 24, 35, 41, 60, …. and profession: épicier, commis, greffier, boulanger, chandelier, domestique, tailleur, rentier, négociant, marchand de tabac, agriculteur … ; shows the great variety of individuals." "1793-1794: Les tribunaux Revolutionnaires lyonnais", SEHRI - Le Blog. La Révolution et nous (blog by Claude Guillon) 1.8.2014.